Tina Zaffiro’s talisman of love for our beautiful broken world and a crow! and a crow eye glasses case she made just for me! PS January 2019 getting to know Sharmon Davidson’s book talisman nearly a year later! 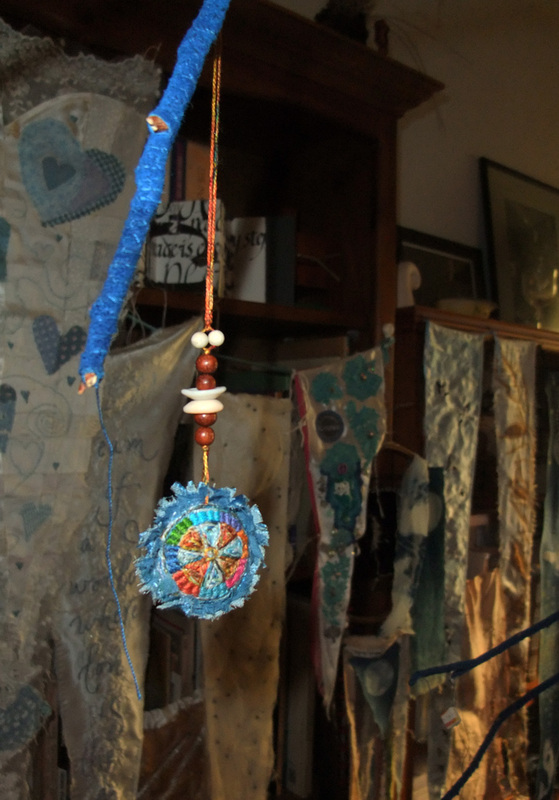 Tina has so movingly created a beautiful, talisman that is the essence of I Dream of A World Where Love is the Answer for where do we find our first love? If we are fortunate, we find our foundation of love from our family. 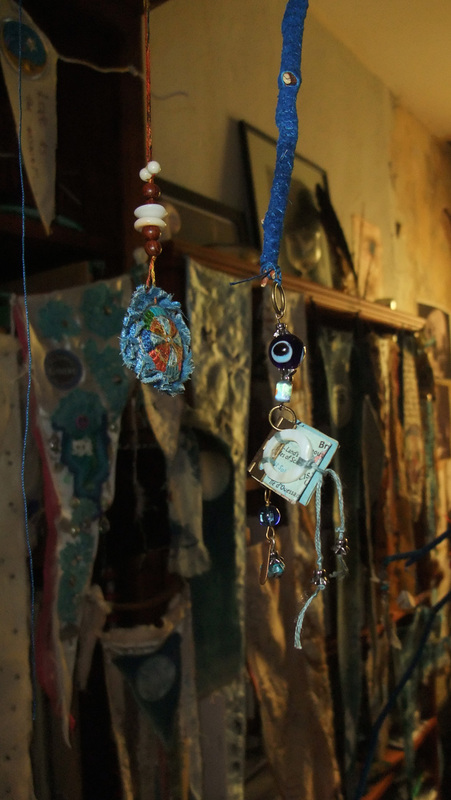 Tina’s talisman material choices hold deep meaning and speak so dearly of family with beads and shells from her Mother and Father. The colors lf the fibers bring a sense of serenity as well as joy that speaks so strongly of the heart, of peace and of Hawaii. I say this from having lived for two years in Maui and traveled extensively in Hawaii, Kauai and Oahu. Blues for the sea and sky, soft corals for sea shells, sunrises and plumeria blossoms. Equally Tina’s words telling us of her talisman moved my heart. Her life experiences of family, community, surroundings, have given her a strong foundation and it is that foundation of love that has created a caring, creative, sharing, encouraging and connective woman who is able to translate those qualities into her art. Tina speaks of her thankfulness for those she has met in this accepting, generous community of women. We who know her are thankful for her presence for she is a treasure, as is her talisman..
Marti, thank you for these beautiful words for Tina’s talisman and for this circle of good magic & love that is growing each day for our beautiful broken world, as you say so well “Si se puede!” yes we can! I am so touched by this beautiful talisman and the deep heart that nurtured it into being. Beautiful Tina. 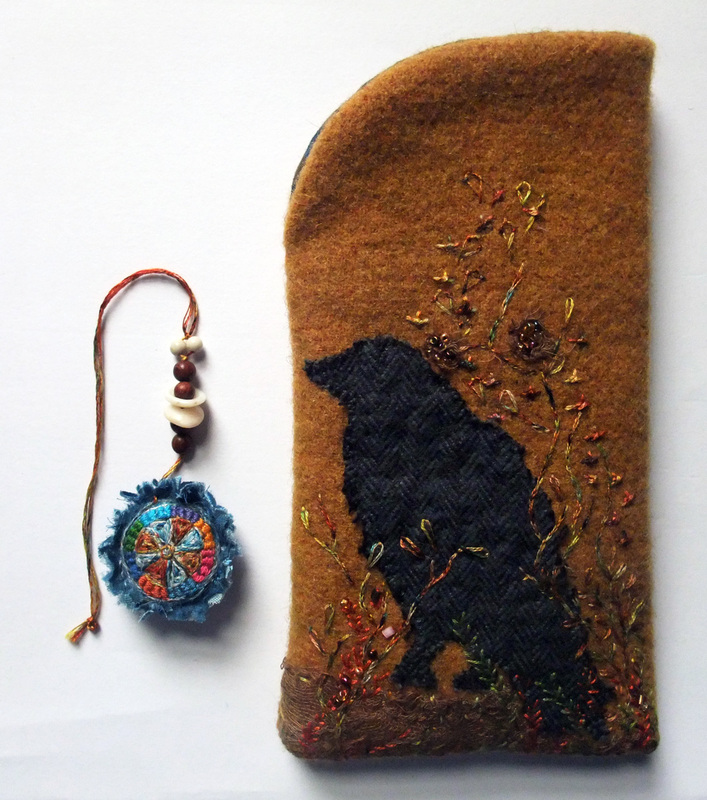 (((Nancy))) Tina makes such good magic, the colours & textures glow with such gentle deep heart in the talisman and the crow eye glasses case is both beautiful and much needed as my glasses haven’t had a case for months! What a little beauty, perfect in every way! So heart warming to see these lovely things and read Tina’s letter. (((Louise))) Tina’s beautiful detail blows me away, the circle is strong, magic is afoot! how wonderful, did enjoy her story as well, her talisman is stunning- lucky you- the crow eye case! (((Susan))) they are such beauties, Braille for the Soul! Beautiful art and words, and your new glasses case….oh my! (((Nanette))) I love how Tina magically turned a piece of herringbone woolen cloth into a crow ! Tina’s thought and heart full mandala and words are beautiful, and a lovely symbol of self and this powerful circle. ox to you both. (((Hazel))) Tina’s stitches are exquisite! Tina elevates the energy of every conversation she takes part in with her glad heart of gratitude. I love that she brought in the ancestors and shared a little about her remarkable past.